Superior Instrument makes measuring indoor and outdoor areas as easy as possible with our heavy duty engineer’s measuring tapes. We have open-reel measuring tapes that extend over 300 feet made with durable stainless steel tape designed to withstand inclement weather and frequent, rugged use. Our measuring tapes for surveying include measurements for both metric and inches with reinforced housing and are fully retractable. We are dedicated to bringing you the very best measuring tapes from top brands including Keson and Lufkin to ensure you enjoy years of exceptional performance. 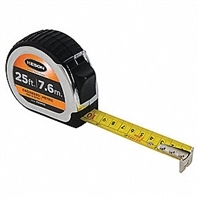 Whether you need a new measuring tape for construction, surveying, or woodworking, we have the most versatile selection with affordable prices you won’t find anywhere else. We have the best closed and open-reel measuring tapes with every length you need. Order now to take advantage of our affordable prices with fast shipping on all orders or give us a call at (888) 852-7377 to speak with our team of experts who can help you find everything you need before you buy.